The pilot, Into the Ring, is about Karen Page, a secretary at a financial firm that's handling money for the post-Avengers rebuilding of New York City. She finds some iffy money practices, and finds herself framed for murder. There is a nice bit of detective work going on, nice fight work, and sets up the next episode with the kidnapping of a boy by evil Russian white slavers. With the second episode, it takes place right after that, with the camera angle pointing straight down into a dumpster, with Daredevil's body lying in it. The kidnapped boy was a trap, and he's had the heck beaten out of him. Instead of wasting time with a fight at the opening, we see the aftermath, and it works. Most of that episode is just Daredevil talking with someone who saved his life, with Karen Page and Foggy Nelson getting plastered together on a night out on the town. There is exactly one fight scene in the entire episode. It works. A word on the actors. They have a Ben Uric who is a refugee from Chicago Hope, back in the 90s. I'm not sure where they're going with him yet, but I'm okay with it ... even if his boss looks more like the comic character than the actor they have. And, yes, Foggy Nelson, Murdock's partner, is in the series. He's got a strange look, he's obviously not Jon Favreau of the movie, though they're both doing basically the same (good) job. There are moments in these episodes that are very well executed. The first episode -- heck, all the episodes -- has Arrow-like flashbacks that break up the action nicely, without resorting to fake-outs of "oh no, the hero might be beaten." Yeah, no, we know that Daredevil isn't going to be beaten to death in an alley in the first episode, so the flashbacks draw out the tension. The moments of art occur more frequently as the episodes go on. In the second episode, Cut Man, there is a fight scene in a hallway. The interesting part is that the camera never leaves the hallway, even when the fight does. The director just tracks the camera back and forth through the hall. It's surprisingly well done, leaving a lot to the imagination. Episode 3, Rabbit in a Snowstorm, has several moments. Including a bit where Matt Murdock tracks someone because he has a Cartier watch, and just follows the ticking. In fact, it's almost a musical leitmotif, the way it's handled. Darth Vader has the Imperial March, the Kingpin's right hand man has a ticking watch. It was also a nice touch to put together the ticking watch with the speeding heartbeat of a juror on a fixed jury. During a closing argument to a jury, the camera shoots Murdock from several different, interesting angles, going from the back, the side at a high angle, and sweeping around to the front. And then, at long last, at the end of the episode, we have the reveal of Kingpin ... and his first appearance is almost like shooting Murdock before the jury, using some of the same angles. This Kingpin wears all black -- shirt, tie and jacket. It's a nice inversion of the all-white ensemble that the comics use.But then again, I have this feeling that both Fisk and Murdock will be modifying their costumes as time goes on. Vincent D'Onofrio's Wilson Fisk at first comes off as a little sad. When asked "How does this piece of art make you feel?" He answer was only "It makes me feel alone." Huh. Interesting. The short version is, I'll take this over Agents of SHIELD any day of the week, and twice on Fridays. It is well written, brilliantly directed, and if it stays this good, I will get the DVD set. In short, this was awesome. 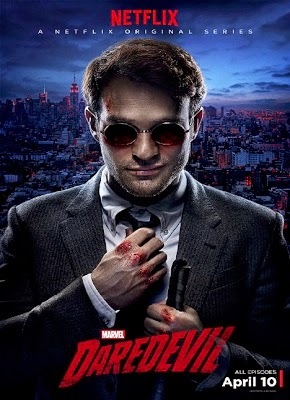 The show might have made Daredevil one of my favorite heroes. It might be slow at times, but the characters were so enjoyable and the themes so well done that I barely noticed. I hope this did well, I would definitely be up for a second season.